Make sure the cooling system is filled with a 50/50% antifreeze solution. Fill the fuel tank. Make sure the fuel fill cap is properly installed. Drain the carburetors into an approved gasoline container. If storage will last longer than one month, carburetor draining is important, to assure proper performance after storage. With the engine stop switch in the OFF position, press the start button several times to crank the engine and distribute the oil. Remove the battery. Store it in an area protected from freezing temperatures and direct sunlight. Check the electrolyte level and slow charge the battery once a month. Wash and dry your motorcycle. Wax all painted surfaces. Apply rust-inhibiting oil to the chrome pieces. Inflate the tires to their recommended pressures. Store your motorcycle in an unheated area, free of dampness, away from sunlight, with a minimum of daily temperature variation. Place your motorcycle on blocks to lift both tires off the floor. Cover your motorcycle with a porous material. Avoid using plastic or similar non-breathing, coated materials that restrict air flow and allow heat and moisture to accumulate. Now, my own procedures, some of which are slightly modified. I should mention that my motorcycles spend the winter in an unheated garage, with minimal exposure to the outside. First on the list, I go for a decent ride - at least a half an hour, and preferably highway speed. This isn't (just) for fun - I want the engine and exhaust system as close to top operating temperature as possible. This lets the oil drain easily, and prevents moisture inside the exhaust (more on this later). Next, I fill the fuel tank. 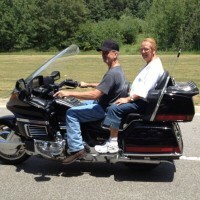 Before doing this, I will go out for a ride and use up as much fuel as possible - I want no more than 1/4 tank of gas. I then add two items: first, half a can of Seafoam. This is normally used to clean shellac and deposits from the carburetors. In this case, I want it sitting IN the carburetors over the winter, to prevent the deposits from forming in the first place. Second, I add a double dose of Marine Sta-Bil fuel stabilizer. Why a double dose, and why the Marine version? First, this stabilizer is used to prevent phase separation - and you cannot do damage by overdosing your fuel. In fact, they tell you to use more when storing for longer periods of time. Second, the marine version of the product is designed for use where there is high humidity and frequent water incursion. It is far better at holding moisture in the fuel in suspension than the regular "red" Sta-Bil. Think of it as regular "red" Sta-Bil on steroids. In addition, the Marine Sta-Bil off-gasses a vapor that coats the inside of your fuel tank that is NOT submerged in gas, preventing corrosion. Once I've added both of these products, I fill the tank to the very, very top with FRESH, quality fuel, leaving as little air space as possible in the tank. Air in the tank = water vapor, so get rid of it as best you can. Lastly, I ride the bike for 5 minutes or so to make sure the fuel with additives has made it fully through the carburetors. I don't drain the carburetors. Especially on the GL1500 (and also on my wife's PC800) draining the carbs is an onerous and painful job. If I was going to be storing the bike for 6 months or so, I would very likely drain the carbs. 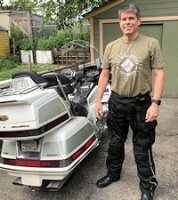 However, when I am storing the bike for four months over the winter, and the carbs are full of a stew of Seafoam and Sta-Bil, they do just fine, and having used this method now for many years, it has never failed me. If your bike has a manual petcock, make sure to turn it off! If you do have a manual petcock, you can turn it off while the bike is running, and just wait until the engine dies. This ensures your carburetors have been drained of fuel. I use this method on things that are run very infrequently, like my generator. Change the engine oil and filter. This is a given. Engine oil accumulates acids during normal engine operation, and left sitting, this will corrode the inside of your engine. Your engine will last many more years if you simply change the engine oil and filter before storing it each winter. For a more detailed explanation of why engine oil must be changed before storage, read this post. The Honda instructions say to crank the engine with the stop switch set to OFF after an oil change, to distribute the fresh oil. This is a good idea, and works on most Wings - except later model GL1500's and GL1800's, which will refuse to crank if the stop switch is OFF. My 2000 GL1500 is one of those bikes, so I instead start it briefly (10 seconds or so) to ensure the oil is fully distributed throughout the engine. Check the coolant. I use Hondaline 50/50 premix coolant, so I know it's always the correct ratio, and it won't freeze. I also change the coolant every two years, so I know it's not worn out. I check the coolant level regularly, but this is a good time as any to check that your coolant isn't low. Clean the fork tubes, and apply a light coating of oil. Pump the front shocks up and down a few times (sit on the bike, push the bike forward, then pull the front brakes while pushing down on the handlebars) to get the oil spread on the seals. This both helps keeps seals lubricated, as well as prevents corrosion on the fork tubes. Check and fill the tires. You do not want your tires low over the winter - and in fact, it's a good idea to do this several times while it is in storage. Battery: I don't remove my battery. Why? Because I have a Battery Tender Jr. installed. I actually plug my bike into the Battery Tender every time it is parked - and in doing so, I went from replacing batteries once every 18 months to...well, I'm not sure, because I've been doing it for five years now, and in the five years since I installed Battery Tenders on all my bikes (and generators, and snowblowers, etc.) I haven't had to replace a single battery. People, seriously, get a Battery Tender, it will pay for itself many times over in extended battery life. As long as your battery is fully charged, the electrolyte will not freeze until near -40 degrees. On the other hand, a discharged battery can freeze at very close to 32F/0C, and a frozen battery is extremely dangerous! Put a Battery Tender on your bike, leave it plugged in, and you don't need to worry about pulling the battery from the bike. Those of you who store your bikes somewhere where electricity is not available, they now offer a solar-powered Battery Tender that will keep your battery in top shape with sunlight alone. Wash and dry your bike. Really? Washing it? Actually, yes. Bug guts, road tar and general grime contain acids that will dissolve the protective coating on your paint - and your paint itself. Eventually the paint will just look bad. But I don't get out the hose for this job. I use the greatest invention motorcycling man has ever devised: Pro Honda Spray Cleaner and Polish. This stuff is so good, that virtually all bike shops use it. It makes cleaning your bike a non-event. I even use it on my car. Spray it on, wait a few minutes, wipe off with a clean towel, you're done. The result is an immaculately clean surface, with a protective coating left behind that will bead up water. You can use it on painted surfaces, plastic, windshields, chrome, aluminum, every surface on your bike. For chrome and steel parts, it leaves behind a coating that prevents corrosion from humidity over the storage period. Lift your bike so it is not resting on the tires. Well...again, perhaps if I was storing my bike for six months or longer I might do this. Instead I simply put the bike on its center stand. This leaves maybe 40-50 pounds of weight on the front tire, which is really nothing, comparably. If you're really worried, you can put a wooden block under the engine block to lift the front wheel up off the ground. Keep in mind this will make the bike a bit less stable. Another alternative is to go in every couple of weeks, have someone push down on the rear of the bike to lift the front wheel in the air, then rotate the front wheel to prevent the same part of the wheel from resting on the ground. What we're really trying to do here is prevent flat spots from forming. Cover the bike with a porous material - I don't bother. If my bike was outside, then yes, 100% I would be covering it up. But inside my garage, where the temperature remains fairly constant, there is very little dust, and there is little moisture intrusion, I leave it out in the open. More important is having an environment with a more or less constant temperature. If you are storing your bike outdoors, you should be using a cover that covers up as much of the bike as possible, is waterproof, but breathable. Do not use a tarp! This allows moisture to collect underneath, and will cause rapid corrosion. Mufflers - mufflers rust from the inside out. They depend on the heat of the exhaust to evaporate moisture, so it is imperative that the bike was not just run for a few minutes and then shut down - this leaves moisture inside the exhaust, where it will sit and rust away while the bike is stored. This is the main reason we want the last ride before storage to be a long, fast one where the engine is working hard. We want things to be hot! Once things have cooled off, I spray WD-40 into the ends of the exhaust pipes (WD = Water Dispersal), then cover the ends of the pipes with a plastic shopping bag and a rubber band. This prevents the intrusion of moisture into the exhaust system. Hydraulic fluids: If you haven't flushed/replaced your brake and clutch fluids in the past couple of years, this would be a good time to do them. These fluids are hygroscopic, which means they leach moisture out of the air - and moisture means corrosion. I typically do this every other year as part of my winter maintenance, so I don't normally do this at the time when I put my bikes away for the season. Mice: Mice and other vermin LOVE motorcycles. They have lots of little cavities in which they can build nests, and they just LOVE to chew on electrical wiring. The air box in particular makes a perfect home for them. I put galvanized steel mesh over my air intake to keep the critters out. I keep mousetraps baited with peanut butter around the area the bikes are stored (they love peanut butter more than they love wiring), and putting Bounce brand dryer sheets in and around the bike helps keep them out. For some reason, they detest the smell of Bounce dryer sheets. Now, what do you do now that the bike is away for its winter slumber? Please, please, PLEASE resist the temptation to "start it up to keep the oil fresh" or whatever other reason you feel you need to regularly run the engine. Your engine does not benefit in any way from being started from dead cold for a short "warm-up." In fact, it's quite the opposite. Starting the engine puts lots of moisture into both the crankcase and the exhaust. If you are not going to go out for a good, hard half hour ride, neither the engine nor the exhaust are going to get up to full normal operating temperature - which means this moisture is not going to evaporate. Instead, it's going to sit in the bike and start corroding the insides of your engine, cylinders and exhaust system. Every time you start it, it is making it worse. The fact that it is cold outside makes it even worse - this means the moisture easily condenses on the cold surfaces, starting the rusting process. Once we get closer to spring, I'll write a follow-up article on how to un-winterize your bike. Please feel free to comment on methods and techniques you use that work well for you! Thank you for this great article. I have done some of those things you say are a no no and now will not do them. I also always took my battery off and took into the house but now will leave my tender on it. Thanks again and looking forward to the un-winterizing article. you can't beat a battery tender. can't remember the last time i changed my battery , which performs flawlessly during the season. Thanks for the winterizing tips. 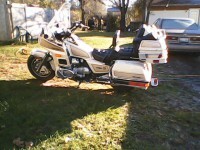 My 1980 Goldwing still looks and runs great. 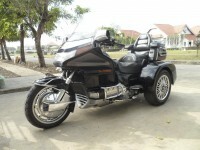 I guess I am fortunate - I live and ride in the Far East, I mean the real far east, Thailand! our temps are regular, around thirty C everyday and we dont have to worry about "putting up for winter"! However, I do carry out an annual service, very much similar to what you do, just to check things through. Great reading, and reminds just what a cruel winter can do! Great list! The only thing I would add is to change/clean your air filter. I run a K&N reusable air filter so cleaning, oiling and replacing the filter is definitely on my list of winterizing to dos. kibbie wrote: Great list! The only thing I would add is to change/clean your air filter. I run a K&N reusable air filter so cleaning, oiling and replacing the filter is definitely on my list of winterizing to dos. Air filter is one of those things I put on my "every other year" winter maintenance item, along with brake and clutch fluids and fuel filter. Great ideas. If you have a snowmobile, I stared using my battery in both toys. I was shocked it was the same size. Thanks for the great write up. 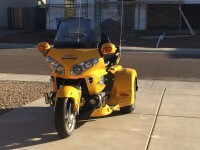 I have several bikes including, at the moment, 2 GL 1500's. Since I live in a warmer climate, Northern California, I usually go for a ride about once per month or more if the weather permits. I do start my bikes and let them run until everything is good and hot if I can't go for a ride. I have done this for many years and have yet to have a problem as a result. Most exhaust systems have a small hole in the lower part of the system to drain moisture out, if you have stock exhaust. Good ideas using Seafoam and Marine Stabil. I will have to check out the Honda Polish. Here in the frozen North, I keep riding also... I sit on the bike and watch Motorad, MotoGP, Closer to the Edge or any other motorbike show/movie. Gets great fuel mileage this way. Next, I fill the fuel tank. Before doing this, I will go out for a ride and use up as much fuel as possible - I want no more than 1/4 tank of gas. I then add two items: first, half a can of Seafoam. This is normally used to clean shellac and deposits from the carburetors. In this case, I want it sitting IN the carburetors over the winter, to prevent the deposits from forming in the first place. Second, I add a double dose of Marine Sta-Bil fuel stabilizer. Why a double dose, and why the Marine version? First, this stabilizer is used to prevent phase separation - and you cannot do damage by overdosing your fuel. In fact, they tell you to use more when storing for longer periods of time. Second, the marine version of the product is designed for use where there is high humidity and frequent water incursion. It is far better at holding moisture in the fuel in suspension than the regular "red" Sta-Bil. Think of it as regular "red" Sta-Bil on steroids. Once I've added both of these products, I fill the tank to the very, very top with FRESH, quality fuel, leaving as little air space as possible in the tank. Air in the tank = water vapor, so get rid of it as best you can. Lastly, I ride the bike for 5 minutes or so to make sure the fuel with additives has made it fully through the carburetors. I feel sorry for that bike in the photo. the owner should be left outside sitting on that bike for the winter so he'll know what it feels like to be "abandoned" in the cold and snow. Winterize??? Oh yeah, that time of year I wear a windbreaker. mightymousesr wrote: Winterize??? Oh yeah, that time of year I wear a windbreaker. Warming up quick up here, supposed to be 60+ degrees this weekend, though the a.m. temps are like 30 or less. Unwinterize? sure, do the same thing for winterizing only in reverse . lol, I was going to say "Get on your bad motorscooter and ride!!!!!!!!!!!!!!!!!!!!!!" No need to "unwinterize" down here. Most of California didn't have a winter this year. I put a thousand miles on teh GW in January. Winterizing here just means putting on more gear. i'll agree with that DarthJ. I can! It was last year when someone unplugged my battery tender. I don't know how long it was unplugged before I found it, but the new battery cost $150. Much more than a battery tender. Check out www.chromebattery.com ....... Batteries at half that price. I have them in my Goldwing and in my Virago, both for more than a year. No problems. bstig....i just took a look at that website and the battery that fits the 86 1200 SEi, and it shows under its specs, it only has 240 CCA. that's not really a lot of amperage. the one that's on my bikes came from o'rielly's auto parts and have 400 CCA's and its priced @$134.99 + core charge. (i have one of these battery's on both my 1100 AND my 1200) for these larger bikes with a lot of their electronics and extra lighting, i would think that a battery with more surplus cranking amps would be a better battery, but that's MPO about it. im not saying the battery on that site you suggested isn't worth it, but personally, i would look for a larger CCA battery regardless of the cost. best part about it is you can go right to the auto parts store and get it and not have to wait 3-5 days for them to ship it.